ASB is giving 500 runners an extra push in the lead up to the ASB Christchurch Marathon with ASB Fasta. 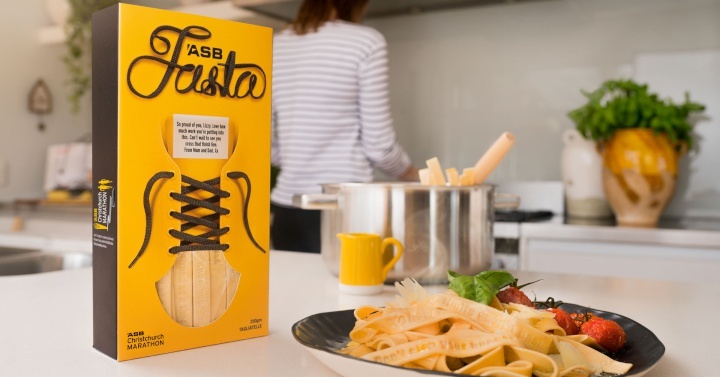 ASB Fasta is an edible tagliatelle pasta embossed with supportive messages to keep runners’ spirits (and energy levels) high as they train – then race – in the ASB Christchurch Marathon event on Sunday, June 3. Supporters can visit asbfasta.co.nz to nominate a race-registered friend or family member to receive a 250gram box of complimentary ASB Fasta. Nominators can personalise the ASB Fasta box with their own supportive message to sit on the front of their nominee’s box. ASB Fasta nominations open on Monday, May 14 and will close Sunday, May 20 at 8.00pm. Winners will be selected at random, and will receive their personalised packs of ASB Fasta at the race pack pick-upon Saturday June 2 at Cathedral Square. ASB head of community, sponsorship and event Mark Graham says ASB understands running a big race can be an exhilarating experience, but it is the ultimate test for the body and mind. “ASB is involved in a range of running events across New Zealand and we’ve found it’s often the week leading up to the race that runners start to get nervous. This year, we wanted to create something tangible to help keep runners one step ahead by showing them they’ve got a team of people willing them over the finish line,” Mr Graham says. “ASB Fasta is packed full of carbs to energise the body and inspirational messages to boost the mind. We hope runners enjoy ASB Fasta and on race day, when the course feels like it’s getting the better of them, they’ll remember these words of support,” Mr Graham says. ASB Fasta was created by Pasta Madero’s Wade Lewis. Visit asbfasta.co.nz to enter details of your nominee. Nominees must be registered to race in one of the four ASB Christchurch Marathon events which includes the full marathon, half marathon, 10km and children’s marathon distances. Create a personalised support message to sit on the front of the ASB Fasta box (message must be less than 150 characters, including spaces). Submit the runner’s contact details to go into the draw to become one of the 500 runners to receive a box of ASB Fasta. • Keeping you One step ahead, one strand at a time. • The pain will pass, but the glory will last. Know your limits and then run pasta them. It’s not how Fasta you run. It’s how far you go.